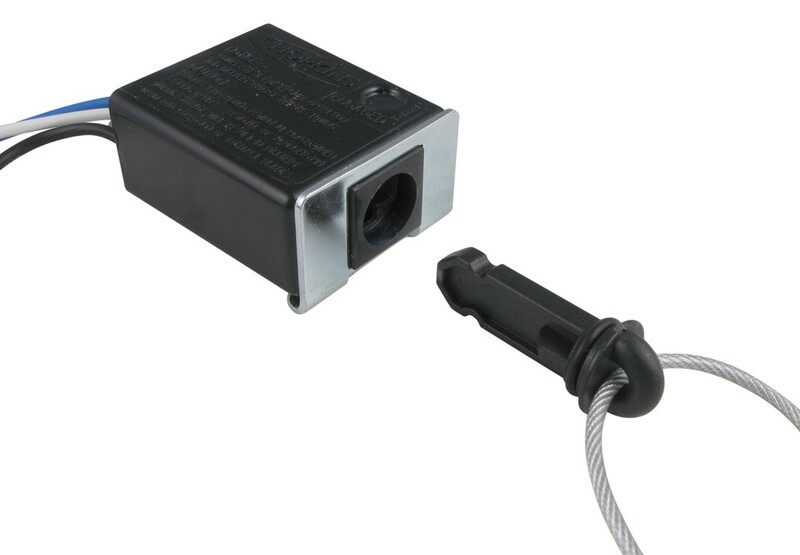 As a crucial component to a trailer breakaway system, this breakaway switch activates the trailer brakes should the trailer become disconnected from your tow vehicle. 48" Long breakaway cable and 44" long installation wires. 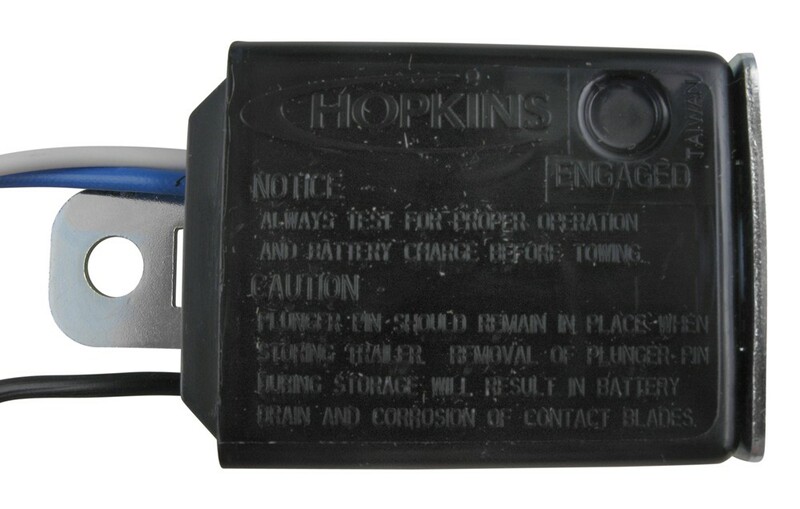 Call 800-298-8924 to order Hopkins accessories and parts part number HM20060 or order online at etrailer.com. Free expert support on all Hopkins products. Guaranteed Lowest Price and Fastest Shipping for Hopkins Pull to Test Breakaway Switch with 48" Long Cable. Accessories and Parts reviews from real customers. 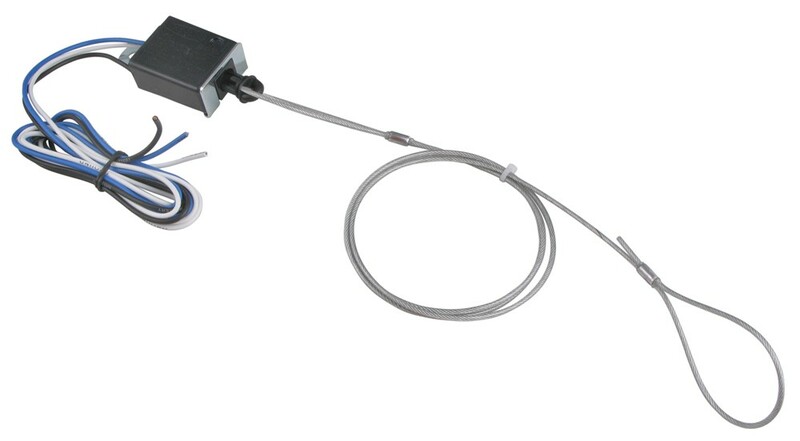 As a crucial component to a trailer breakaway system, this breakaway switch activates the trailer brakes should the trailer become disconnected from your tow vehicle. 48" Long breakaway cable and 44" long installation wires. Length of breakaway cable: 48"
Length of installation wires: 44"
Today on this enclosed trailer, we're going to install part number HM20060, from Hopkins. This is their LED breakaway switch. Our first step is to go ahead and remove the original breakaway switch. We'll follow the wires back to the junction box underneath the trailer, then we'll go ahead and disconnect the wires. We'll pull them loose, and we'll also disconnect the wires going to the breakaway kit battery. These have two terminals, so we'll just remove them from the battery. We'll take our blue and white wires and run them to the junction box and make our connection. Our blue wire from the breakaway switch will hook up to the brake lead in our junction box. In this case, we will connect it to the black wire. We'll strip it back and splice it in. We'll repeat this with the white wire, which we'll splice with the other white wires for ground. Once those connections are made, we'll put the cover of our junction box back in place. Now we'll go ahead and take our black wire from the switch, and we'll run it up through our breakaway battery. Now we'll have to add a terminal to it so we can attach it to the battery. We'll also get an extra piece of white wire, and we'll use that for our ground. We're going to take the negative side of the battery and we're going to ground it to the frame. We'll cut our extra wire the length we need. We'll strip both ends back. On one end we'll put a ring terminal, and the other a battery terminal. These connectors are not included with the kit. Now we'll mount our breakaway switch. Now we'll go ahead and test it. We'll pull the pin, and you can see how the LED lights up when there's power being applied to the brakes. And with that, that will finish it for our test fit of part number HM20060, from Hopkins, on this enclosed trailer. Order: RelevanceNewestRating - High to LowRating - Low to High As a crucial component to a trailer breakaway system, this breakaway switch activates the trailer brakes should the trailer become disconnected from your tow vehicle. 48" Long breakaway cable and 44" long installation wires. There was definitely a short somewhere on your brake output circuit. A bad ground would just cause the circuit to not function. I attached a help article that covers everything on testing brake magnets. It is possible that when you were replacing the bearings you damaged the brake output circuit and that is why it is shorting out. Two sources of 12 volts applied to the same circuit would not double the voltage to 24 volts. Essentially this wires the circuits parallel to each other so the only thing changed is increased amp hours due to more amps applied. If you were to wire to 12 volt circuits in series instead then the voltage would double to 24 which would cause problems. I attached a picture that shows the difference between series and parallel wiring. The Hopkins LED Breakaway Switch # HM20060 has a red LED light to indicate that the cable has been pulled. My technical contact at Hopkins suggested that you may have the black and blue wires reversed; this would cause the light to stay on. Please refer to the linked installation video for illustration of how to wire this switch. The red LED light on the Hopkins LED Breakaway Switch # HM20060 indicates that the cable has been pulled. My contact at Hopkins said you may have the black and blue wires reversed. This would cause the LED light to stay illuminated. I have attached a link to a video for this breakaway switch that shows how it's wired when installing. The breakaway system actually must be attached to its own separate battery by law in most states. Therefore, I cannot recommend that you use a seperate, auxiliary battery on the trailer or the vehicle for that matter for the breakaway switch. The most cost effective breakaway system we have for you is the Curt Soft Trac II Trailer Breakaway Kit part # C52026. I have attached a photo for you to show how it will need to be wired. To add a break away system to your trailer, you will need a switch like the Hopkins LED Breakaway Switch, # HM20060, and a battery that meets DOT specifications for a break away system. 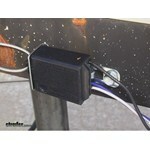 Or you can by a whole kit like the Engager Trailer BreakAway Kit with Charger and Tester, # 20099. With this kit, you get the switch, battery, case, LED tester, and charger. I have included a link to the installation details below. I have also included a link to our FAQ article on break away systems.